In August 2013, ArenaNet announced a new edition of Guild Wars 2, the Heroic Edition. It is a premium version comparing to the standard edition, bringing you a more powerful and fantasy game-play. The GW2 Heroic Edition CD Key allows player to gain more benefits in the game, which cannot be seen via its standard CD Key. Enter the game with a Guild Wars 2 Heroic Edition CD Key, you can gain these bonuses! 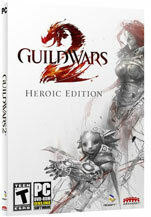 Now on Mmosale you can find Guild Wars 2 Heroic Edition CD Key in the best price. To ensure you can have the best online shopping experience, we will deliver the GW2 Heroic CD Key to you in 20 minutes after your order is confirmed. If you have any questions, please do not hesitate to contact our 24/7 online Live Support.